Birthday Wishes for Friends: Don’t know how to wish your friend a happy birthday? Can’t think of a funny message to write on your best friend’s birthday card? Searching for something nice you can post on your friend’s Facebook on his birthday? Wondering how you can express your feelings for a special friend on her birthday? Thinking of something sweet to say to your bff? Whether it is for a classmate, schoolmate, buddy in college or a colleague in the office – this post will help you create your own quotes which you can scribble out on a greeting card for your bestie. 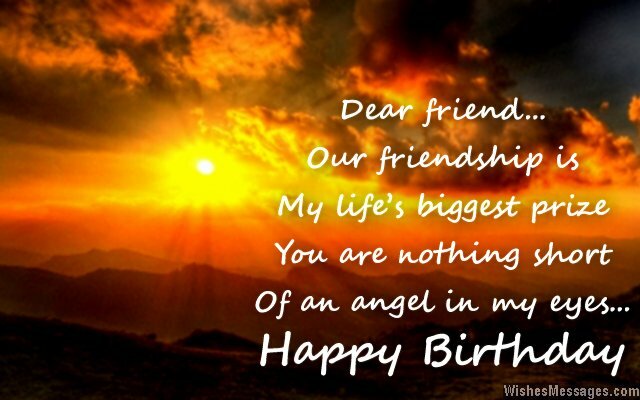 1) Dear friend… our friendship is my life’s biggest prize – you are nothing short of an angel in my eyes. Happy birthday. 2) You are like a treasure that I would keep in a chest and loose the key, so that no one else in the whole world can steal you from me. Happy birthday. 3) Wikipedia may have answers to all the factual questions in my life but you have answers to all the emotional ones. Happy birthday to a special friend. 4) When I fight with my mom, I come to you. When I fight with my boyfriend, I come to you. When I fight with my teachers, I come to you. When I fight with my brother, I come to you. Maybe I should send my mom, boyfriend, teacher and brother to you for some personality training so they stop fighting with me. Happy birthday to my bff. 5) Our friendship is like music. It rocks my world and lifts me up when I am down. Happy birthday. 9) I will always stand by you, stand for you and stand with you. Now, isn’t that a truly democratic friendship? Happy birthday. 10) As a metaphor, our beautiful friendship is a cake that I can have and eat it too. Happy birthday. 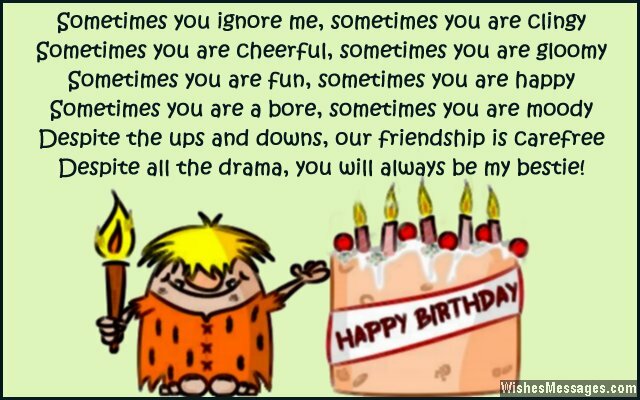 11) Dear friend… just like how you get pleasantly surprised when you open your birthday gifts, I wish that you get the most awesome surprises as you open up yet another beautiful year in your life. Happy birthday. 12) Our friendship really tests my limit of tolerance for sweetness, cuteness and happiness. You are lucky that these are things which I can tolerate in abundance. Happy birthday. 13) I am going to write a Thank You note for your parents on your birthday because if it weren’t for them, you would have never been born in this world and been my friend. Happy birthday buddy. 14) Only I know the importance of having a friend who will shut up when I need someone to listen to my rants and who will angrily rant when I need to shut up. Happy birthday. 15) Wolverine, Optimus Prime, Superman, Spider-Man, Iron Man, The Hulk, Magneto, Batman, Thor and other superheroes have all the powers in the world except the most important one – the power of friendship. Happy birthday to my superhero. 16) Sometimes you ignore me, sometimes you are clingy. Sometimes you are cheerful, sometimes you are gloomy. Sometimes you are fun, sometimes you are happy. Sometimes you are a bore, sometimes you are moody. Despite the ups and downs, our friendship is always carefree. Despite all the drama, you will always be my bestie. Happy birthday. 17) Gifts can be thrown away, but the wishes of true friends like me will stay with you for the rest of your life. Happy birthday my friend. 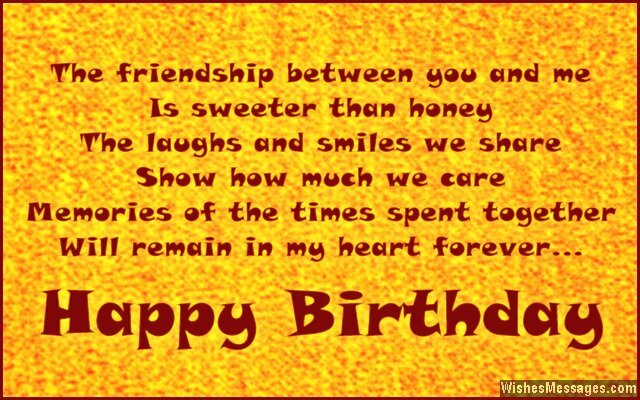 18) I was searching online for something sweet to write on your birthday card until I realized that all I had to do was to look in my heart. Happy birthday to the friend who is also my soul mate. 19) If we were part of a band, we would call it Fun Direction because hanging out with you is so much fun. Happy birthday. 20) The worst part of the birthday of a friend like you is that it is going to get over tomorrow, so soon. Happy birthday. 21) Do you know what sadness, sorrow, despair, grief, unhappiness, anguish, misery, agony, distress, regret and trouble have in common? They have all been missing since I have had you in my life as my friend. Happy birthday. 22) I am going to change your name to Oxygen because friends like you are the most important thing I need to survive. Happy birthday Oxy. 23) The fact that you decided to be friends with me is the sweetest form of flattery I have ever received. Happy birthday. 24) You are such an amazing friend, that you have made the complexities of my life easier to comprehend. Happy birthday. 25) The only reason I am not flustered even though I am single is because I have an awesome mate who never lets me feel alone. Happy birthday. 26) The Hangover trilogy would be put to shame as compared to all the crazy things we have done together as friends. Happy birthday mate. 27) When I dream about a life in the company of friends like you, I see a rainbow. When I dream about a life without the company of friends like you, I see total darkness. Happy birthday to a friend who makes my life vibrant and colorful. 28) Out of all the best experiences I have had in my life, our friendship has been the bestest. Happy birthday. 29) Our friendship is a smile machine – I smile when I see you, I frown when I don’t. Happy birthday. 30) On your birthday I am making a wish. I hope that we can be close friends just as we are right now, even when we are frail, fragile and old. Happy birthday to my real life partner. 31) The friendship between you and me, is sweeter than honey. The laughs and smiles we share, show how much we care. Memories of the times spent together, will remain in my heart forever. Happy birthday. 32) You fight with me, you annoy me, you nag me, you curse me. You argue with me, you harass me, you lie to me, you make fun of me. Despite all this I still tolerate you as my friend, because I do the same things to you. Happy birthday. 33) There are many types of friends, but you are the only type I would have a true friendship with. Happy birthday. 34) Our friendship is cooler and trendier than Harlem Shake and Gangnam Style combined. Happy birthday. 35) There are two types of friends. The first type, are the friends whose birthdays are reminded by Facebook. The second type like you, are the friends whose birthdays are reminded by the heart. Happy birthday. 36) Since there are no expectations in friendship, am I excused from buying you a gift? Happy birthday. 37) It is a pity your birthday comes only once a year because I love partying with, and giving hugs to friends like you. Happy birthday. 38) Our friendship is strong like iron but finished with a coat of gold. Iron rusts with time but gold never corrodes, plus it shines too. Happy birthday. 39) If I had to describe you as a body part, I would call you a Shoulder. That’s because you are a shoulder I can cry on, a shoulder I can lean on, and a shoulder which supports me through good and bad times. Happy birthday to my Shoulder. 40) The only reason I didn’t wish you on Twitter like everyone else is because I can’t convey my feelings for a friend like you in 160 characters. Happy birthday.